Which tied in nicely with the Cotton & Paint magazine swap with Siow Chin. I love that magazine, I even took it to bed to read last night. How 'sad' is that ? Today I am frantically working on things for the children's Christmas fair on Friday, I've made some robins ( I'll be putting the pattern up on Fri ), there are penguins to be sewn up, and stickers to be made. I also have a Christmas craft session with 25 seven year olds tomorrow (God help me), and was wondering if anybody has any ideas for things to do that take about half an hour. ? I have kept the morning free, so any cutting out or prep can be done then, and yes, I've already thought of taking plenty of Christmas tape to gag them if the noise level gets too high - which it will. Any other suggestions (craft or crowd control), would be very gratefully received. I love the purse. I really like how you made his arm as a closure. Very clever!! We are into puppets here, so that is the only suggestions I can think of at the moment! Good Luck! My husband has been teaching 7 year olds this week. And don't feel sad about taking your craft books to bed. I always have, even my Blythe doll ones! My philosophy is that I like to go to sleep with a cute/nice/happy image in my head. Just make sure you have enough Pritt sticks. For some reason, fights break out here over bloody Pritt sticks if there aren't enough! I just love all of your crafts. Your Softies are so adorable! I'm going to definitely try to make one of the little pandas. Thanks for the pattern and instructions. Your blogsite is awesome! I just realized that they are little purses!! Even more adorable. Beautiful job! Did you come with these on your own or are they a pattern from some where? WoW! just amazing! This little guy is so cute, I'd love to have something so sweet to pull out of my purse, who wouldn't smile : ) As for the 25 girls, I say a drink is in order before they get there. I can't even manage to get a craft day organized for my one 7 yr old, so I'll be interested to here what you decide to do and how it goes. Good luck! this guy turned out great! So cute! I am so thankful you shared this (and the instructions a few days ago.) I printed them out and hope to make at least one of these before the holidays arrive! This is so adorable...as are all your little sweet animal creations. Thank you for sharing the dimensions a few days ago. There is a new wee babe in the family that I want to make one for. Love the panda bag and little panda keychain -- beautiful! i love the lines of this panda. sending you good energy for your upcoming adventure. What a great little purse! 25 seven-year-olds? Yikes!! Maybe little felt Christmas ornaments, in different shapes and colors, with a ribbon at the top for hanging? I second the music idea, too. Make sure they aren't hungry!!! :-) good luck! Adorable! I love the little panda head zipper pull! In terms of project suggestions, I can't think of any right off the top of my head right now. When I see them in books and magazines, I always think, "Oh! If I had kids or knew some kids, this would be perfect" but since I don't have any and don't have access to any (that sounds creepy, but you know what I mean), I sort of forget them. If I think of anything, though, I'll throw it out there! How about making Christmas themed puppets out of lunch sacks? (elf, snowmen, angel, santa, reindeer, grinch, etc.) There are so many Xmas characters that would lend themselves to that little project. You could pre-cut shapes (eyes, antlers, hats, etc.) if that would make the project flow better. But, please note you'd need to untape their mouths for the show. I love the sweet little panda purse- especially the little panda face on the zip!! I think the puppet idea is a good one - my mother-in-law is a teacher of kids that age, and often gets them to make puppets out of little paper bags, she says they love it. Good luck with the kids! You could get them to make a felt advent calender (in the shape of a manger, say)for xmas eve - include space for a mini-sized twix bar! I don't think it's sad that you take such a book to bed with you, it is said say perhaps when one's hunky husband carries the owner's manual of his brother in-laws GPS to the beach to read, or even sadder perhaps when same hunky husband brings a 1971 book entitled Understanding Electronics to bed. um, anyhoo, any chance you could show us the inside of one of those little bags? Panda's are the sweetest - and what a neato little purse. Good luck crafting for the christmas fair - I bet all that crafting will keep you out of trouble for a while! I'm not sure about crafts for the kids, but there must be a buttload on the net to dig up. Have fun! So incredibly cute as always. I love my Cotton & Paint magazine too! I'm keeping my fingers crossed that I'll get my hands on the Christmas issue. You can make great christmas angels in to time with 7ers and then decorate a little tree made from a vase full of sticks. Make a dress that folds in half down the shoulder line so it looks like a big T, with a scolloped bottom and a bit flared. Can be done in paper or felt. Make a small hole at the neck and thread through a pipe cleaner, attach a biggish bead to the pipe cleaner for head and run a cotton thread off the top for hanging up later. Attach another pipe cleaner (or bend the first one if it's long enough) horizontally to form arms with beads on each end to form hands. Put a couple of stitches (or glue) to close the sleeves and side of dress. If any of the kids are good with a needle they can do more decorative stitches, but two clumsy stitches is all it takes. Glue a little cotton wool or regular wool on the top of the head for hair, and make it look pretty with a tiny headband from paper or felt or glue. 25 of these hanging from a make-shift tree love absolutely gorgeous. PS the Panda is fabulous! Paper chains are always good. If you're doing music, you can supplement with singing Christmas carols, and we like to add variety by singing in different styles...Opera-style! Underwater! Sing in a made-up language! Sind as loudly as you can! Whisper-singing! etc. It looks even more striking on a red background. Your colour sense is impeccable! I'm definitely looking forward to your robin pattern and hope to one day make softies like you do. Thanks again, Lyn! Just do what I do! Precut some Christmas ornament shapes out of foamcore--star, bell, round and collect bits of ribbon, old christmas cards,wrapping paper, foam snowflakes, etc--glitter and glue and pipecleaners--oh, and construction paper. Kids glue stuff on the shape--poke a hole through the top and stick glittery pipecleaner through to hang. They love it and they pretty much all look great! I've done this for 25 kids and much more! I love all the ideas people have given you - can't wait to hear what you've decided to do with your 7yo group! wow! that is super cute! thanks for keeping up such a cool blog. you rule!! Don't have much to add that hasn't been suggested already - was just going to suggest making collage Christmas cards - construction paper, old Christmas cards, last years wrapping paper,stickers, crayon or marker embellishments (word to the wise - glitter looks great - but gets EVERYWHERE.) Or there's the make a reindeer out of a candycane - use the kind of candycane with a "hook" - have them twist brown pipecleaners once around the top of the cane, then bend them outwards for the antlers; glue on "googly eyes" and a little red pompom nose (if Rudolph the red-nosed reindeer is well-known there), glue those on the front of part of the candycane hook for the reindeer face. You can tie on a bit of ribbon or gold cord for hanging on the tree. The gluing on the googly eyes does take a bit of dexterity though - & now I can't remember what age group you said - bah! Darn sleep-deprived brain! Good luck tomorrow (which is probably now today......) G'night & good luck, Lyn! Love your drunken penguin soldiers. You realize that you are slightly demented, but, that is why we all keep coming here. Please persist! All of you animal purses are WONDERFUL! Love them! Love your blog! 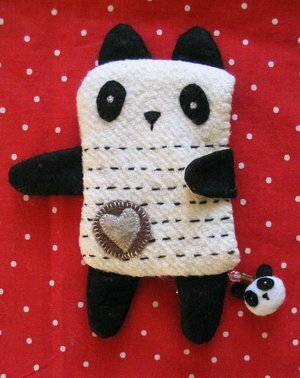 Love the panda purse, where do I found a manual to make one? wow tooooooooo cute!!! Thanks for sharing. I have also printed out the instructions... and hope to finish it within these two weeks.